We seem to be advancing with eyes wide open into the Perfect Storm! 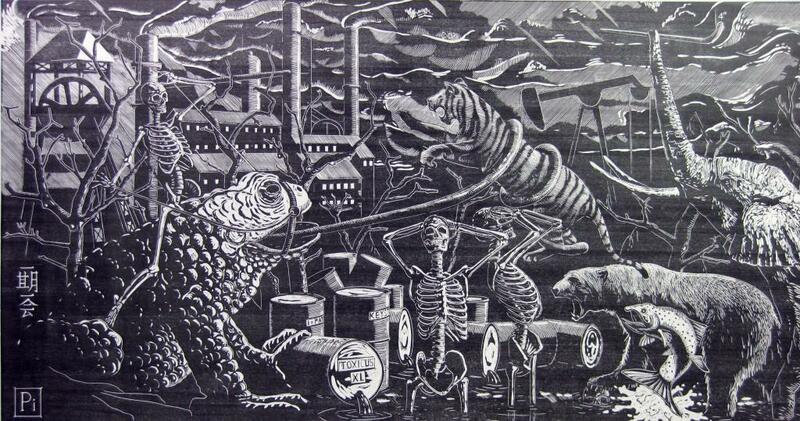 My Gaia series explores the environmental crisis in the form of paintings, woodcuts and etchings. The woodcut is inspired by Prof. James Lovelock’s Gaia Theory. I have used Gaia as a metaphor for this print and a series of paintings (underway). She is shown in the print raising her arms below the symbol for the Sixth Extinction, borne by the two eagles. 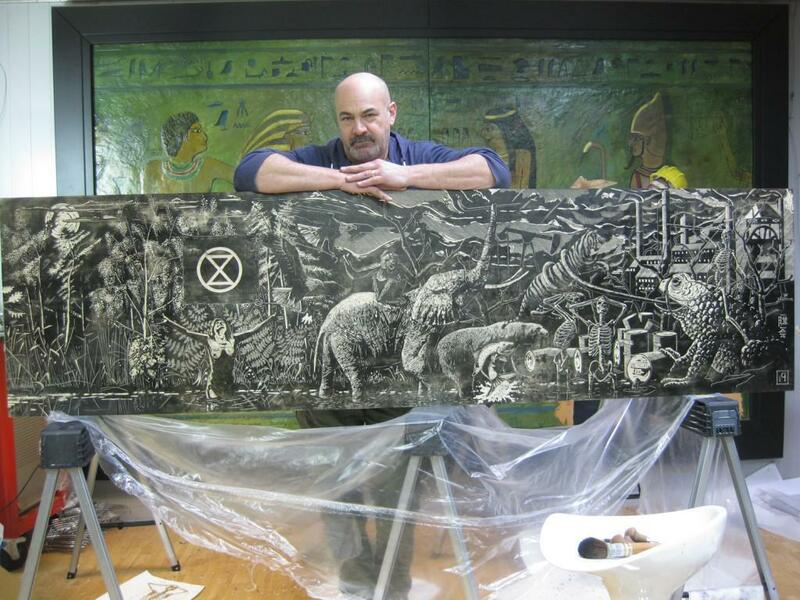 The Sixth Extinction (Holocene Extinction) is being triggered by humans by our treatment of the environment, recently accelerated to about 140,000 species per year lost. Huge population growth, resource depletion, deforestation, ocean trawling, dumping and industrialisation leading to climate change have exacerbated this event. Gaia stands within a paradise to the right of the print, mother nature, the earth in all its splendour, whilst on the other side are the humans with their processes of destruction: too many to place in a single woodcut, hence the series. 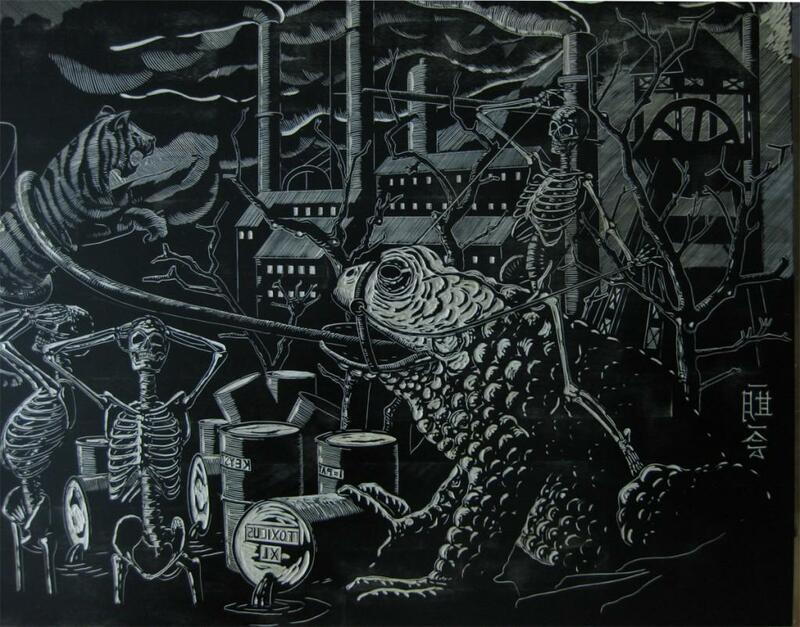 The creatures (I’ve shown a few) are leaving Gaia and bound to extinction, ensnared by pollution and destruction, symbolically portrayed by the skeleton mounted on the toad. The remnants of humanity wail in despair at the spectacle, unable to stop their own demise. The science is overwhelming now, either we act or we perish. There is no planet B to escape to if we destroy life here. My pictures are a warning, a lament, my contribution to the debate on the future of humanity and our relationship with Gaia. Waiting for our politicians to act is not an option. Most are in the hands of their corporate sponsors and will obfuscate and deny unless we push them and call them out. This is my way of contributing. Gordon is on Twitter @sutongirotcip and his website is pictorignotus.com Born 1956, Horden, County Durham, United Kingdom Married, lives and works in his Derbyshire studio BA Hons, Sheffield Psalter Lane Art College. Gordon has had numerous positions and travelled extensively through the Middle East, Saudi Arabia, Dubai, Yemen, Lebanon, Bahrain, Africa and Europe, with particular interests in religion, democracy, politics, the environment and culture. The results of these studies form the basis of the series of works now under way.